There is no runaway top player in this class. Here’s the case for each, plus a pick. Not all college football recruiting rankings are the same. Between the three ratings systems — 247Sports, Rivals, and ESPN — the data used to evaluate players are different. A team could claim to have the nation’s No. 1 overall player, but that guy might not be the top prospect in multiple outlets’ rankings. For example in 2018, both Rivals and 247Sports listed five-star quarterback and Clemson commit Trevor Lawrence as the No. 1 overall prospect. But ESPN’s rankings had Georgia commit (who has since transferred to Ohio State) as the No. 1 guy. In 2015, all of these outlets, plus the Composite and Scout (which was since folded into 247), listed different No. 1 players, for a total of five. In 2019, defensive ends Antonio Alfano, Kayvon Thibodeaux, and cornerback Derek Stingley are rated as the No. 1 guys at 247, ESPN, and Rivals, respectively. But defensive end Nolan Smith can make a case, as well, since he is so high up in all three. Let’s take a look at all four of these guys. Alfano is the No. 1 strong-side DE in the 2019 class and the nation’s No. 5 prospect per both the 247Sports Composite and Rivals. But he is the No. 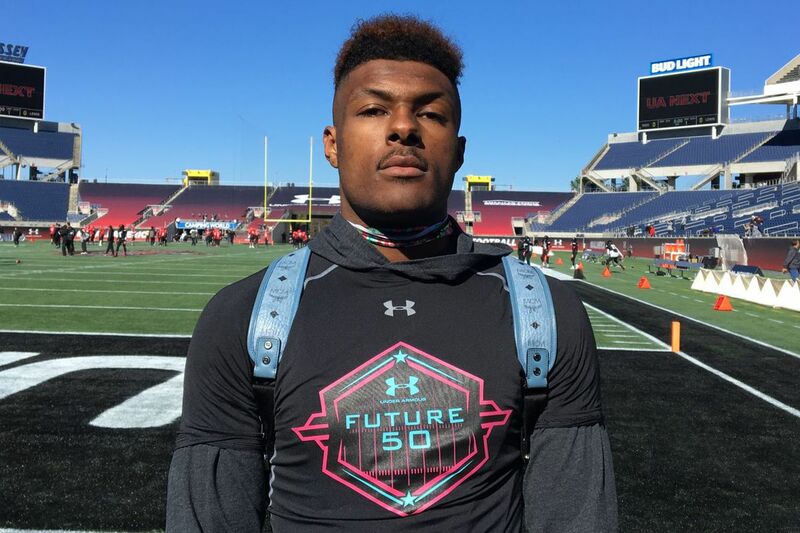 1 prospect in the 247Sports (non-composite) ranks. The Colonia (N.J.) prospect early enrolled at Alabama after signing during the Early Signing Period in December. He was committed to the Tide since May 2018, picking Bama over Penn State and Georgia. If Alabama’s coaches could be guaranteed a virtual clone of Jonathan Allen (2013-16), they’d be over the moon. That is essentially what the Tide is getting in Alfano. Allen was 6’4, 269 coming out of high school. Alfano is 6’4, 274 as of late December. That is tremendous size, but what truly made Allen special, and what will make Alfano special, is the ability to stay outside as a five- or six-technique, as opposed to having to move inside to defensive tackle. Most players this size cannot do that. It takes unique athleticism to be able to “play up,” as opposed to having to move inside as a player becomes bigger and stronger. Allen left Alabama at 296 pounds, and Alfano should be able to do the same. When you see Alfano in person, it’s just different. He moves like a player who is 244, not 274. He has heavy, violent hands. He plays hard. A legitimate three-down impact player, he is perhaps the surest thing in the 2019 recruiting class. Stingley is the No. 1 prospect in the Rivals rankings, and the No. 3 overall in the Composite. He is unanimously considered the top cornerback recruit in the nation. Out of Baton Rogue (La.) Dunham School, the five-star enrolled early at LSU in January. Stingley has been committed to the Tigers since June 2018. He checks in at 6’1, 190. Stingley comes from an athletic family. His grandfather was an NFL player, while his father played both professional baseball and football. He has an excellent feel for the position, as evidenced by many interceptions in which he baits the QB into a throw or beats a receiver to his spot. And that’s on top of a great build with awesome length, which will allow him to play press coverage in college, while his athleticism will help him excel in off. The length to press, the athleticism to play off techniques, and the smarts to excel in zone: Stingley Jr. has all of the tools to be selected as the top cornerback in the 2022 or 2023 draft, if he develops. Some of his high school plays remind me of Jalen Ramsey. Von Miller at the same age. The question will be how natural he is playing more as a linebacker at the college level. All of these players are elite talents, but come with some questions. Alfano was at three different high schools in the last three years, which is not a red flag, but can be a bit of a yellow one for coaches. Stingley’s competition level in high school was not the best. Thibodeaux doesn’t always play with a elite effort. And Smith does have to move positions. There is not a runaway No. 1 in this year’s class. I’ll go with Smith ever so slightly over Stingley. Both are the clear top athletes at their respective positions, so I’ll take the pass rusher, which is slightly tougher to find than a cover corner.